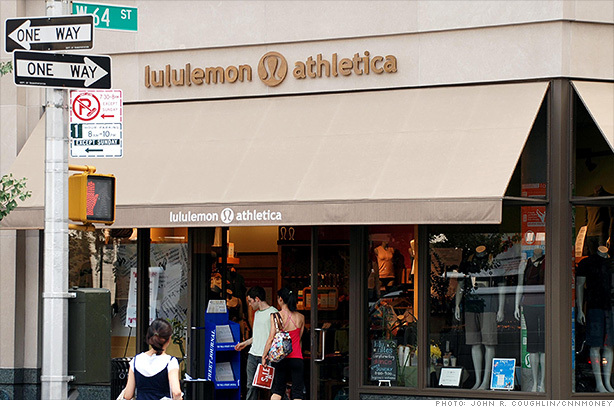 Investors are rewarding athletic apparel maker Lululemon (LULU) for remaining zen. The company, known for its fashionable yoga pants, beat analyst expectations with its third quarter profits and revenues. The only hiccup: guidance. The company said it expects sales to grow in the high single digits in the fourth quarter. That's good for most retailers but points to a slowdown for Lululemon. Investors didn't seem too worried about a slowdown. The stock traded up more than 4% Thursday. And several traders on StockTwits admired the company's conservatism. If they bully $LULU today on conservative guidance, I probably buy. Got your back, girl. Even with a slowdown in sales, Lululemon still looks good to many investors once they look around at other brands and retailers. While Apple (AAPL) may not be the ideal comparison this week, a hot brand is a hot brand. Longer-term what could really help the company's growth prospect is the emerging male yogi. More men in Lululemon's yoga pants? A new clientele.